As every year, Alicante celebrates the coming of the summer with the Bonfires of Saint John, Hogueras de San Juan. This festival lasts for 5 days, from 20th to 24th June. It brings hundreds of people into the street willing to enjoy music, food, firecrackers and the most important thing… fire! During these days, the city comes to a full stop. Streets are filled with party and joy and fireworks light up the sky. People gather together at the so-called barracas (large tents in the streets with tables, chairs and a dance floor) to eat out, have cooling sip, sample the typical figs and coca am tonyina (a pastry with tuna, onion and pine nuts) and dance both day and night. 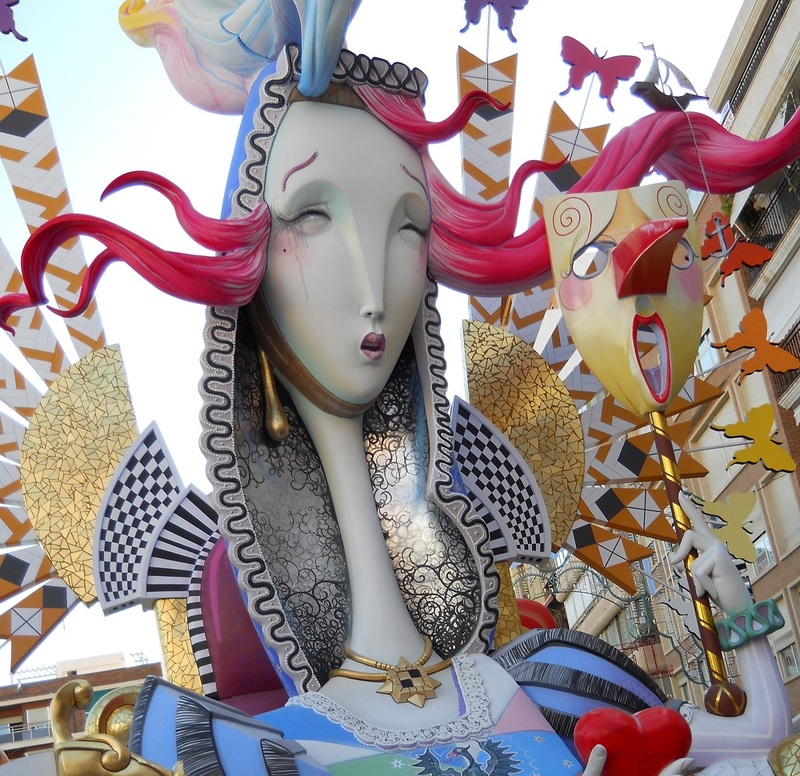 In the beginning of June, different events take place such as the Ninot and Children’s Ninot Exhibition, the Paella Contest, the Opening Ceremony, the Ninot Parade and the nightly mascletàs (firecracker displays) which take place at 00:00 every night from 13th June to 18th June. The daily mascletàs take place at Luceros Square every day at 14:00 from 18th June to 24th June. These mascletàs are displayed by a different firework company each day. The Bonfires officially start with La Plantà (the set up) on 20th June. Colossal monuments made of papier-mâché, wood and different flammable materials are set up in the streets as well as the above-mentioned barracas. These monuments, which are known as Hogueras, satirically depict Spanish society and caricatures of politicians and celebrities. The Hogueras are entered in the Monument Competition which is the most important contest in Bonfire-of-Saint-John events. Works of ephemeral art which will be burnt and destroyed in a bonfire called La Cremà (the burning) held at midnight on 24th June, St John’s Night. It starts with fireworks in the shape of a spectacular palm tree on Santa Bárbara Castle. From that moment on, the Alicante’s 90 Hogueras go up in flames one by one. It is the highest point of this festival and marks the end of it. The Beauty of the Fire, Bellea del Foc, is the queen of the festival and presides over each institutional act together with the 6 Ladies of the Fire, Damas del Foc and the mayor. She is chosen from among the candidates presented by each Bonfire committee to be the visible face of the Hogueras. 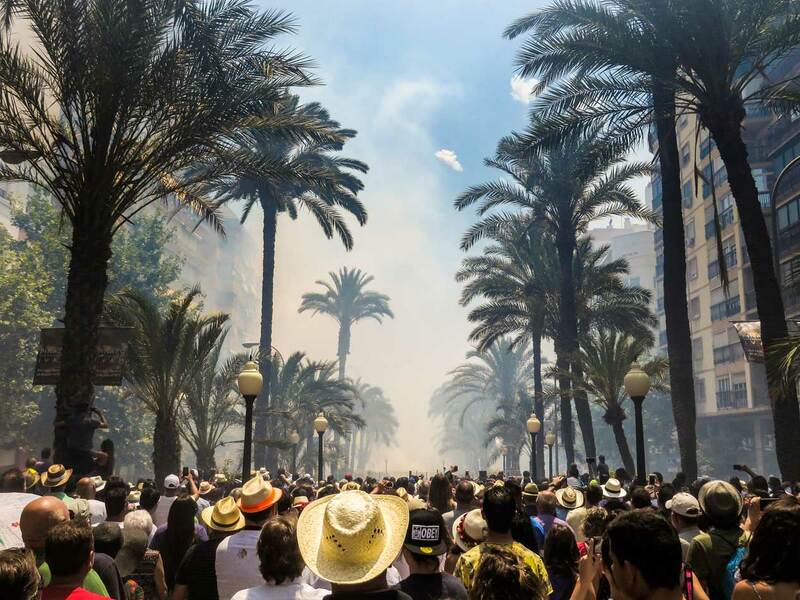 On the days following the Cremà, a Firework Display Competition is held over El Postiguet Beach from 25th June to 29th June. A spectacular display of colours and fire attracting hundreds of people. Its origin dates back to ancient times, when farmers would harvest the crops on the longest day of the year and would light purifying bonfires around which they danced to burn curses and evils away. This agricultural ritual soon spread to large towns. However, this tradition of letting off fireworks and setting up bonfires was forbidden in 1822. The townspeople simply ignored the law and continued celebrating the Hogueras. The so-called Ninots (statues) were born in the streets among music, dances and games. The extravagant Ninots are satirical statues depicting the bizarre behaviour and defects of some neighbours in a fun way. But it was not until 1928 when the festivity was officially accepted and formally constituted. The City Hall considered the festival to be a major tourist attraction and the best way for locals to continue enjoying their traditions. The festival has developed a great deal during the last years and new elements have been added such as the barracas and the Beauty of the Fire, the queen of the festival, in 1932.